New findings show that current smokers had an 83% higher incidence of rapid renal function decline compared with never smokers. African Americans who smoke cigarettes are prone to kidney function decline, a new study finds. Michael Hall, MD, MS, of the University of Mississippi Medical Center in Jackson, and colleagues looked at renal function decline in 3,648 African American men and women aged 21 to 84 who participated in the Jackson Heart Study, 2000-2004. Among these, 422 reported current cigarette smoking, 659 past, and 2,567 never. Compared with those who never lit up, current cigarette smokers had an 83% higher incidence of rapid renal function decline, defined as a 30% drop in estimated glomerular filtration rate (eGFR). The finding was significant, even after adjustment for relevant factors such as body mass index, diabetes, hypertension, and cardiovascular disease. The findings corroborate past studies on smoking and kidney function in various populations. Additionally, the investigators found the more cigarettes smoked, the greater the kidney injury. African Americans who reported currently smoking up to 19 cigarettes daily had a 75% greater incidence of rapid renal decline than those who never smoked, whereas those who smoked more cigarettes had a 97% greater incidence, according to results published online in the Journal of the American Heart Association. Higher rates of chronic kidney disease (CKD) among African Americans have been attributed to hypertension, obesity, and diabetes. Dr Hall and his team also investigated the role of systemic inflammation. Current and past cigarette smokers, respectively, had 38% and 10% higher levels of C-reactive protein—a marker of systemic inflammation—compared with never smokers. The researchers again observed a dose-dependent effect. Several cohort studies, such as the Chronic Renal Insufficiency Cohort (CRIC), the Framingham Offspring cohort, and the Multi-Ethnic Study of Atherosclerosis (MESA) have shown similar associations. Potential mechanisms include oxidative stress, endothelial dysfunction, and atherogenesis. Overall, African Americans are less likely to smoke than Caucasians. Their metabolism of substances in cigarettes may differ, however. For example, previous research found differences in enzyme CYP2A6-mediated nicotine metabolism between African Americans and Caucasians. The researchers also noted that popular use of menthol-flavored cigarettes has been linked with increased blood concentrations of cadmium, a toxic metal. Previous research has linked exposure to low levels of cadmium with kidney damage. Hall ME, Wang W, Okhomina V, et al. Cigarette Smoking and Chronic Kidney Disease in African Americans in the Jackson Heart Study. J Am Heart Assoc. 5:e003280. doi:10.1161/JAHA.116.003280. 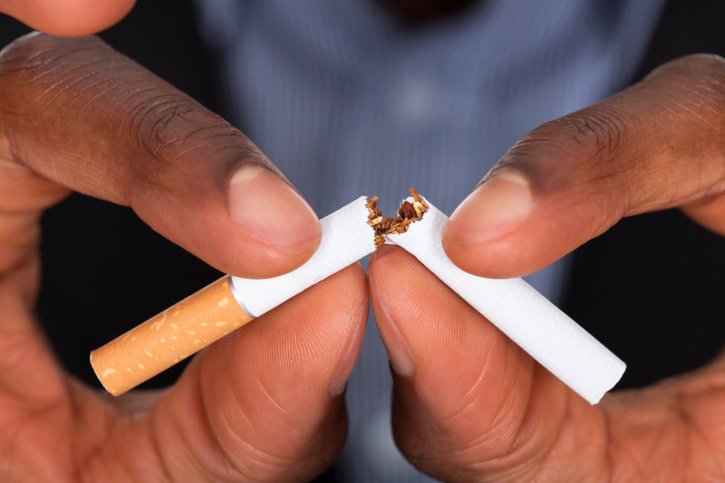 Smoking May Increase Kidney Disease Risk in African-Americans [news release]. American Heart Association, May 25, 2016.